This is no dry and dusty battlefield tour. Prepare to fire up your imagination as you take a personal journey through the sights and emotions of the Battle of the Somme. Follow in the footsteps of the lads who bravely went before us 100 years ago, see the places they fought, discover their stories and how their experience is still relevant to us today. David Thomson, historian, owner of No.fifty6 B&B and associate member of the International Guild of Battlefield Guides, will stir your imagination as you walk in the footsteps of the fallen across the fields now so peaceful. Standing where soldiers stood before you, David will paint the picture of life in 1916 and set the scene of the ferocious fighting that took place above and below ground. You’ll witness the only remaining evidence of the horror when you visit the extraordinary Lochnagar Crater, the largest mine crater in the world and the trenches at Beaumont Hamel. 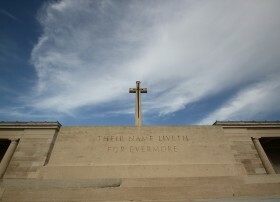 You’ll hear individual stories as you wander the battlefields and the cemeteries. Look at the headstones, put yourself in the shoes of each person, and reflect on the events and young lives so cruelly extinguished in WW1. The “Walk With Me” Experience will be tailored to your timescale and interests or family connections. We have escorted all ages from 4 to 85 on a Walk With Me day. Please use the contact form on the right to tell us a little more about your visit so that we can prepare your experience in advance. "I must also say the day on the battlefield was fantastic, and for that a big thank you Dave. It was very emotional at times."